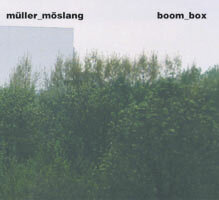 Boom Box is one of the first recordings of Norbert Möslang after the break up of Voice Crack, his legendary Duo with Andi Gühl which lasted a good 30 years. It was performed in October 2001 in Cologne’s Loft with Günter Müller. Back then Voice Crack still existed, and Möslang’s gig with Müller would seem to be something frivolous. Would it work? To perform in another duo? Without the trusty colleague? Obviously Norbert Möslang and Günter Müller didn’t care much about these questions. boom-box is not about how much or how little it sounds like Voice Crack. Not only, because Günter Müller – drummer, percussionist and live electronics performer in the last ten years – brought along a complete instrumentarium (with this in mind, one could just as easily ask how much or little this recordings has from Müller’s other recordings?). The focus has shifted – with Voice Crack we did not only hear improvisation, but rather the sound of manipulated, half-kaput, destroyed or decoded electronic devises from everyday life. On boom-box, Möslang also plays his cracked everyday-electronics, but their tonal surroundings is a different one. It is a wide, ethereal tonal ambience, the structures are lucid, the music is transparent. Again and again there are foregrounds and backgrounds, individual tonal configurations stand out clearly and distinctly, specific sounds are repeated, thus creating a scaffold through which other sounds are elegantly woven. Since the early 90’s, Müller and Möslang have played with all the greats of electro-acoustic improvisation: with Otomo Yoshihide, Jim O’Rourke, Borbetomagus, Jérome Noetinger, Lionel Marchetti, Keith Rowe, Erik M., Toshimaru Nakemura. The two count as (voluntary/non-voluntary) co-founder of this scene. In the presence of these impressive musical biographies, boom_box is not a summary, it’s not a ”concentration on the essential,” but rather something new, a next step and a very elegant one at that.